The ‘cyclists don’t pay road tax so shouldn’t be allowed on roads’ argument isn’t just a UK or US thing, it’s a hot topic in Australia, too. Just as in the UK and the US, roads are paid for by general and local taxation, not ‘road tax’. The Oz equivalent to the UK’s VED is ‘rego’. Ignorance about what pays for roads often leads to calls for cyclists to “stay off roads; roads are for traffic”. The ‘we pay rego, you don’t’ argument is gaining some airtime in Australia because of a business lobbying group. Street access to the HQ of VECCI – the Victorian Employers’ Chamber of Commerce and Industry – has recently been “compromised” by the addition of a bike-only lane. Chris James of VECCI calls this a “Copenhagen treatment” and not as a compliment about the Danish capital’s capacity for successfully sharing road space between cyclists, pedestrians and motorists but as some sort of European malaise. On the VECCI blog, James said cyclists don’t pay for roads, and ought to be licensed and registered. If they carried motorbike-style registration plates this would provide a way to identify cyclists after an accident or breaches of road rules. After hundreds of forum comments and some newspaper reports on VECCI’s call for registration of cyclists, James was invited on to mainstream Australian radio shows. [James was also chuffed that the Pedestrian Council “has come out strongly in support of the proposals we have put forward for debate”. However, it’s unlikely the Pedestrian Council would call for compulsory registration of pedestrians, or motorcycle-style number plates for pedestrians daring to cross roads ‘belonging’ to cars]. How many of us have seen cyclists riding on a footpath or blithely sailing through a red light? One looks for a form of identification, such as a licence plate but, alas, nothing as the offender proceeds on their merry way. What happens if there is a serious accident? And, of course, there is the question of fairness. Cyclists and their lobby group Bicycle Victoria have been extraordinarily vocal about wanting a network of bike paths constructed throughout metropolitan Melbourne, often on existing roads at the expense of other road users. The upper reaches of Swanston Street are already the site of trendy Copenhagen-style bike lanes, with Albert Street, East Melbourne, now receiving the Copenhagen ‘treatment’. This is close to VECCI HQ and members who visit us by car will no doubt enjoy struggling up Albert Street’s one remaining lane during daytime hours. This is justified by some on the Orwellian grounds that creating congestion will reduce it. 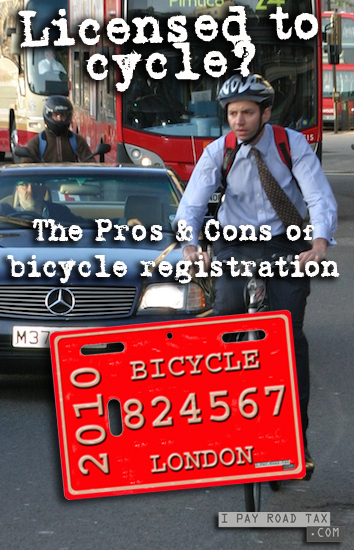 Comments on the blog pointed out that registration of cyclists would cost an awful lot more than it would bring in; wouldn’t make the minority of scofflaw cyclists into angels (car number plates don’t stop motorists breaking traffic laws); and that roads belong to people, not motorists exclusively. 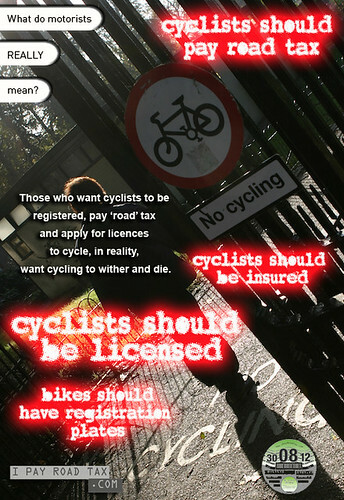 As stated on the iPayRoadTax.com registration/licensing page, calls for cyclists to be registered, pay ‘road’ tax and apply for licences to cycle don’t want to share the road with lots of licensed, fee-paying cyclists, they want less cyclists full-stop. This entry was posted on Tuesday, April 6th, 2010 at 3:47 am	and is filed under Oz rego. You can follow any responses to this entry through the RSS 2.0 feed.